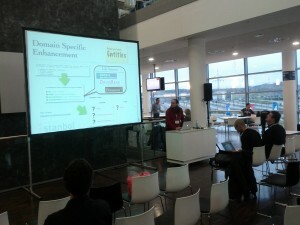 Last week in Sinsheim (Germany) was the ApacheCon Europe 2012. ApacheCons are events organized by the Apache Software Foundation, run by developers involved in the Apache Software Foundation, for all the developers out there building on top of ASF software. Besides that, we attended the presentation of a proposal for incubating a new Apache project based on the Linked Media Framework. It’s really nice to see how Semantic Technologies continue growing under the umbrella of the Apache Software Foundation.